Captain James Byers never dreamed that he would have to highjack his own steamer, the J.B. White from the Confederates and sail it back to the Union lines. Captain James Byers wasn't always a ship captain on the Great Lakes or a United States citizen, for that matter. He was born in Ireland in 1834, but when he was still young his parents came to the United States. They settled in Buffalo, New York and at an early age James came under the fresh water spell of Lake Erie and the other Great Lakes. 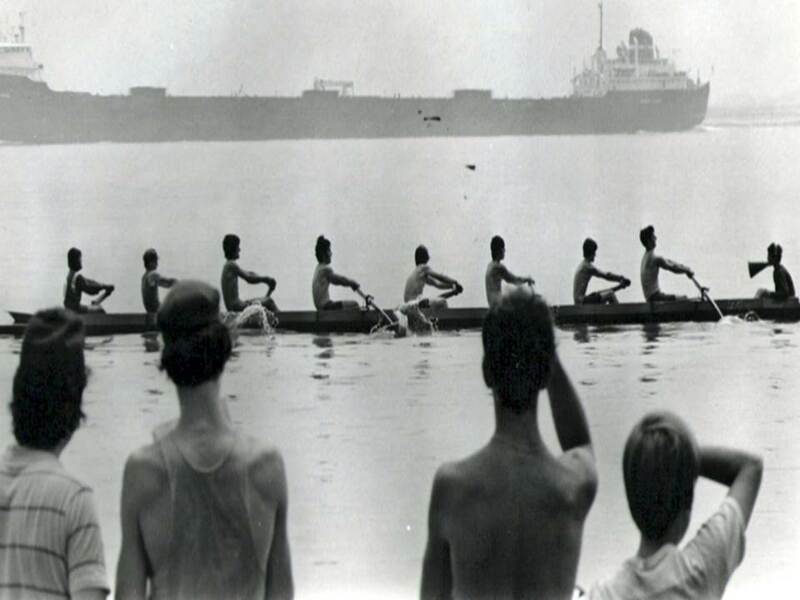 Before he turned twenty years old he had thoroughly learned the duties of pilot and master of lake craft. He sailed the George W. Tift and F.L. Danforth, and became a captain before he turned twenty one. In 1861, the year James turned 27, he had another nautical adventure with far reaching results. A short time before the Civil War began, James sailed to Virginia with the little steamer J.B. White, to fill a contract he had made with ex-Mayor Barton of Buffalo. While James was in Norfolk, Virginia, the Civil War erupted. The Confederates suspected James of being a northern sympathizer, so they seized his ship, the J.B. White and forced him to sail it for Major Milligan of the C.S. Signal Corps. In 1862, the fortune of war had changed. The Confederates were preparing to evacuate Norfolk and Portsmouth, Virginia, and had mined all of the government buildings, planning to blow them up. 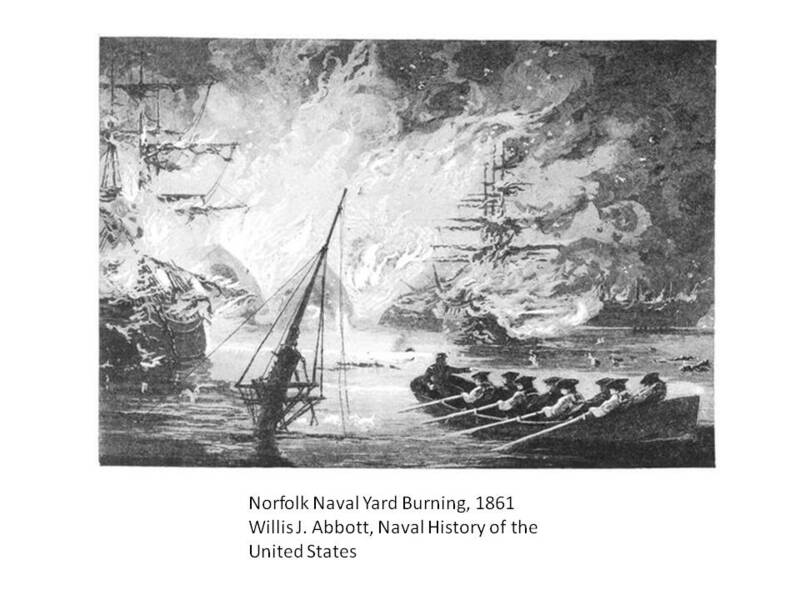 They also planned to burn the Navy yard as well as the government hospital at Portsmouth at the same time. Late in April 1862., Confederate storekeeper William H. Peters received orders to attend a secret meeting in Quarters A. Quarters A was the official residence of the Gosport Shipyard commander Captain Sidney Smith Lee, brother of General Robert E. Lee. Peters took his chair and listened to Captain Lee, Secretary of War Leroy Pope Walker, and Secretary of the Navy Stephen Mallory. This meeting turned out to be one of the most critical in the Civil War and probably the most important in Peter’s storekeeping career. In an 1891 memoir, storekeeper Peters described what happened at the meeting. Secretary of the Navy Mallory told Peters that the military had decided to evacuate Norfolk, Portsmouth, and the Navy Yard and he asked him to formulate a plan to move a multitude of supplies to a place of safety. The battle of the ironclads USS Monitor and CSS Virginia in March 1862, had diminished Confederate Naval advantages and Union President Abraham Lincoln was personally pressuring Union commanders at nearby Fort Monroe to cross Hampton Roads and retake the Gosport Shipyard, the main operations base for the CSS Virginia and local Confederate forces. Storekeeper Peters wrote that Norfolk had to be evacuated because General George McClellan had assembled a large Union Army in front of Confederate General Joseph E. Johnston’s forces. For strategic reasons and because he had greatly inferior numbers opposing General McClellan’s forces, General Johnston decided to fall back within a few miles of Richmond. Captain Byers found out about the Confederate plans and decided to try to save his steamer. He would have to do this by running past the forts and batteries in the J.B. White and informing the Northern Army authorities who were stationed at Newport News of the Confederate plans. Captain Byers planned to go straight to the commander of the Northern forces at Newport News, Brigadier General Joseph Mansfield. The Captain confided his plan to two trusted friends, George W. Griggs and John Nolen. On May 6, 1862, the three men boarded the J.B. White. Flying the Confederate flag, they steamed the J.B. White down the river past the Confederate forts and batteries, and landed at Newport News. They surrendered the J.B. White to General Mansfield. It so happened that President Abraham Lincoln, Secretary of War Edwin Stanton, and General Wool were at the Old Point Comfort a few miles away. The lesser ranking Federal authorities directed Captain Byers to the President and Secretary of War to deliver his startling information in person. A letter from President Lincoln to Congress tells the rest of the story. "On the morning of May 7, 1862, I was at Fortress Monroe, VA., when two or three men came there and said that they had just come from Norfolk and that Norfolk was being evacuated by the enemy. This information proved true, and to a great extent led to the movements, which resulted in our occupation of that city and the destruction of the Merrimac. It was said, and I believe truly, that they came on a tug, which they surrendered to the United States authorities." By May 11, 1862, the CSS Virginia had been destroyed, the Gosport Shipyard evacuated and the Confederate forces were falling back. The Union forces quickly recaptured the area. The loss of Norfolk, Portsmouth and Gosport severely crippled the Confederate Navy and allowed the U.S. to slowly and gradually control the James River all of the way to Richmond. The steamer J.B. White, which Captain Byers and his comrades had recaptured from the Confederates, was used in the Federal Service. Eventually the Confederates recaptured the J.B.White and burned it. Logic told Captain Byers that according to the fortune of war he and his friends were entitled to the price of the vessel they had surrendered to the government and also compensation for the value of the intelligence given. At one time Captain James Byers and his friends presented a bill before Congress asking for some recognition of these claims and it was in support of this measure that President Lincoln wrote the letter. Despite the support of President Lincoln, Congress didn’t appropriate the monetary value of his steamer or reward Captain Byers for his courageous action. He served for the rest of the war and was honorably discharged in 1865. After his discharge, Captain Byers returned to Buffalo and with his brother Robert L. Byers and James Ash, went into the tug and vessel business. He mastered the tug L.P. Dayton, and did the towing for the water works crib for the contractor John Heckler. He also sailed the tug Compound and in 1886, he took the tug International and sailed her for the International Bridge Company. Despite all of his sailing career achievements, Captain James Byers reckoned that his greatest sailing trip was under the Confederate banner to surrender the J.B. White to the Union Army.